Let's be honest: Green smoothies are the perfect on-the-go food. From sparing us the cooking mess to sneaking a bunch of much-needed nutrients to the mix, these mini-meals (if we can call them that!) are practically a godsend for every conscious eater out there. Unfortunately, hitting up the local juice store every other day can be a pricey habit. So, if you're serious about your healthy eating goals (and your budget), it's time to invest in a powerful blender. 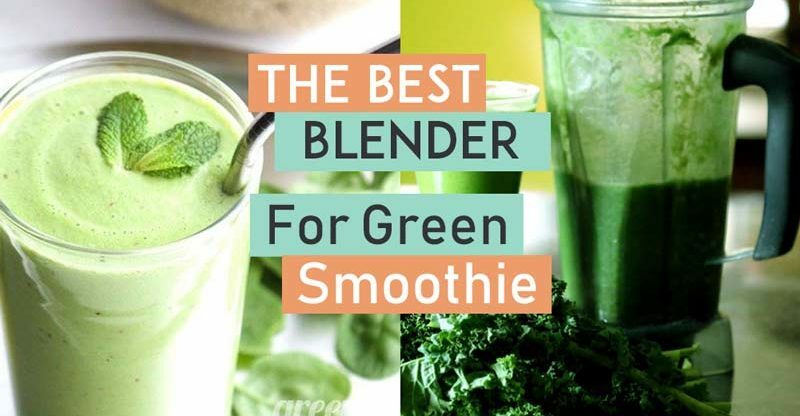 Of course, not all green smoothie blenders are created equal – which is why we tested dozens of them and are happy to present you with the ones that are actually worthy of your countertop. So, without further ado, the following are the 5 best blenders for green smoothies to smash your healthy eating resolutions in 2019. So, we all know that indulging in store-bought green smoothies doesn't come cheap. But, have you ever wondered how much money you spend annually to get your smoothie fix? According to a recent report, juice stores are now part of a billion-dollar industry, and the market is only going to grow stronger over the years. That means that your favorite orange kale smoothie will get pricier by the day. The solution? Get your hands on a high-quality blender! No matter how many fancy ingredients you choose to add to your smoothies, they won't set you back as much as those $10 smoothies. Even though most stores come with a variety of delicious combos, they may not always appeal to you. To avoid sticking with just a couple of options at a time, use your own blender to come up with new combos that will make your taste buds swoon. PS: Since YOU only know what you like, chances are you'll come up with tastier combos than the ones offered at your local juice store. While green smoothies have a reputation for being healthy, you can never be too sure as to what goes inside your drink. From secret additives (think sugar) to stale ingredients, there are a lot of things that can go wrong with your smoothie's quality. One way to avoid all these issues is to make your own green smoothies at home with the help of a trustworthy blender. Not to sound biased, but the #1 thing you need to check when shopping for the best blender for green smoothies is the motor's output. That's because models with weak horsepower can't pulverize stringy produce, leaving large chunks of food behind. On the other hand, models with powerful motors guarantee a smooth consistency every time. To get a bang for your buck, choose a blender with an output of 1.000 watts (minimum), and you'll never have to worry about cutting through tough veggies again. No matter the size of your blender, pick a model with a sturdy design. A firm and slightly large base can help keep the blender stable during use while the air-tight lid will prevent the foods from leaking outside the pitcher. Another thing you need to consider when shopping for a green smoothie blender is the materials. The pitcher is usually made of either glass or plastic. If you choose a model with a glass pitcher, make sure you have enough counter space to store it because it's heavy and fragile. Also, note that glass jars are usually healthier than the plastic ones since they don't contain BPA, a toxic chemical that's used to manufacture plastics. However, if you choose a model with a plastic pitcher, know that you're in for the long term since they don't shutter or break down easily. To make the most out them, opt for a blender that's free from BPA. If you want to make killer green smoothies regularly, also keep an eye out for the blender's speed settings. Top-rated models come with various speed levels which allow you to produce smoothies of different textures. Some models even come with pre-set speed options which eliminate the guesswork and ensure the best result every time. High-quality smoothie blenders come with a variety of safety features. That said, opt for a model that stays off until you attach the lid correctly. Also, make sure your blender has an anti-slip base. This way it will stay put - even at the highest speed. In a world where Vitamix is like a synonym to blenders, the Ninja Professional did exactly what its name suggests: it snuck in and took every smoothie lover by storm. But, trust us, its sharp-looking aspect was just the beginning. Equipped with a 1.100-watt motor and a set of sharp, ergonomic blades, the Shark Ninja model can pulverize pretty much anything, from ice and seeds to skin and even stems (sorry, kale!). That means you can blend everything your heart desires and -why not?- take your green smoothie game to the next level. The Ninja Professional blender also features an easy-to-use interface and a large pitcher, allowing you to prep enough drinks for the entire family at once. Not to mention that it comes with two 16-ounce cups with air-tight lids to take your freshly juiced greens on the go. That's perfect for anyone with a busy schedule who still wants to squeeze a nutrient-rich meal first thing in the morning. Just make sure you don't put the plastic pitcher into the dishwasher. Even though the manufacturer says it's OK and throwing it into the bin makes cleaning a cinch, many customers (including us) noticed that the jar tends to crack after a while. Blowing the rest of the competition out of the water, Vitamix has been providing us with state-of-the-art blenders for decades now. But, it was not until recently when we got acquainted with one of the company's latest models that we remembered why this titan of a brand is one of the best in the field. Perfect for the green smoothie addict, the Vitamix 5200 blender comes with a powerful Swedish motor and a reliable speed control system. These two features allow you to achieve a variety of textures while controlling the blending speed at any point of the process – even halfway. In other words, you are in complete control of how smooth is your green smoothie (pun intended!). The model also has a built-in cooling fan which keeps the motor's temperature low and allows it to go on for as long as needed. 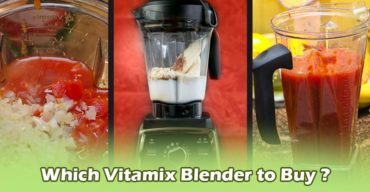 That along with the hardened stainless steel blades make the Vitamix 5200 blender perfect for smoothies that use tough or stringy ingredients such as veggies with stems, seeds, and skins. What's most impressive about this model, though, is the fact that it cleans itself. No seriously, all you have to do is add a drop of dish soap and a bit of water into the pitcher, and the appliance cleans itself in 60 seconds max. Talk about a cool way to avoid doing the dishes! After all these, we're convinced that the Vitamix 5200 blender is pretty much flawless. Except perhaps for its price tag; that's quite high. Prepping large batches of smoothies in one go is perfect for anyone with a large family. But, what happens when you're “cooking” for one? Well, in that case, the Nutri Bullet high-speed blender is a no-brainer. The device sports a bullet-like shape that makes it stand out from the rest on the market. But, this was not an intentional design gimmick. The unique vertical structure along with the bullet-like pitcher force the foods to move towards the blades practically all the time. The result? Your favorite green smoothies are ready in just a matter of minutes. The blender also sports a powerful motor that can cut through and pulverize even the most fibrous of stalks. And yes, the output of this one is below the recommended 1.000 watts (it's actually at 600 watts) but considering the unit's compact size, the motor is more than enough to make a silky AF smoothie on command. Thanks to its small footprint, it's also great for anyone with limited kitchen space or those of you who move around a lot and need their smoothie fix wherever they go. Bonus: It's super easy to clean. You just remove the blade, rinse off with soap and water and load the parts into the dishwasher. Be careful, though, not to stuff the pitcher with too many veggies or fruits. We -as well as many previous owners- noticed that the thing tends to leak from the sides when the container is overfilled. So, add your ingredients accordingly! We know what you're about to say: This blender for green smoothies looks like the one your mom used to slush tomatoes with back in the day. Trust us, though, this model is nothing like that retro kitchen appliance – and we mean that in the best of ways. The Kitchen Aid KSB1570OB blender features a high-end speed control system which consists of five different levels. These levels allow you to perform several tasks depending on the blade's speed, from dicing veggies to pulverizing frozen fruits. So, no matter what you choose to add to your smoothie, it's going to be exactly how you want it to be. The unit also comes with a soft-start feature. That said, the motor starts slow and then speeds up to catch up with the selected settings. By doing so, the food doesn't get stuck between the blades which could break under pressure. This green smoothie blender also has a sturdy die-cast metal base which prevents the unit from moving around, especially when the high speeds roll in. And don't let the plastic pitcher fool you. According to the manufacturer, it's free from BPA which makes it a perfectly healthy choice. The only problem with this Kitchen Aid blender that it's a bit loud. One creative Amazon commenter described the noise as an “angry Chewbacca.” And before you get all excited, note that it may not be as cool as it sounds. If you are a serious at-home smoothie maker, you know that Blendtec is a synonym to high-quality blenders. However, if you are making your first steps into the homemade smoothie world, it's time you found out why this brand has a fan base as loyal as Vitamix's. Meet the Total Classic Original blender! The model features an easy-to-use interface that allows you to make smoothies with the push of one button. Specifically, it has a pre-programmed cycle for smoothies which takes the guesswork out of the process and makes your life that much easier. No wonder it's considered a #1 choice for blending newbies! Some often argue that Blendtec's blades are too dull to cut through a banana, let alone pulverize fibrous vegetables like spinach or kale. But, truth be told, the unit's blades are thicker and stronger than most on the market today. Heck, they even sliced up an iPhone within minutes, so imagine what they can do to your veggies. This green smoothie blender also comes with an automatic shut-off feature which is just perfect for those of you who go through the motions every morning trying to get things out the door. It also has a wide base that makes it more stable than other models. Now you get why it's a top choice for professional chefs, restaurants and juice shops worldwide. The only real drawback is that it's a bit expensive. But, that's a small price to pay considering it will save you lots of money down the line. It's true: Green smoothies are the backbone of a healthy and balanced diet plan. But, since spending a mini-fortune at the local juice store is not an option, we rounded up the 5 best blenders for green smoothies to help you switch to something less expensive ASAP. So, which one is it going to be? We'd love to hear your top picks in the comments down below!